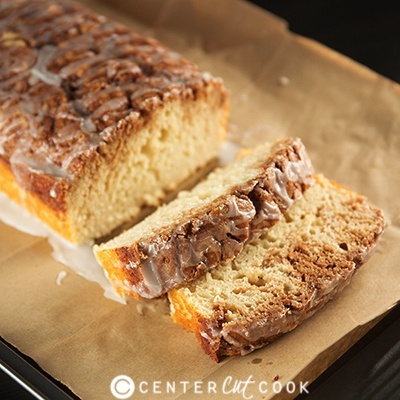 Quick and easy Cinnamon Roll Bread with a cinnamon topping. No yeast required! I’ve always been a sucker for a good cinnamon roll, especially these Fast and Easy Cinnamon Rolls that require no yeast. They are quick, and easy compared to traditional cinnamon rolls that require a lot of patience while waiting for the dough to rise. 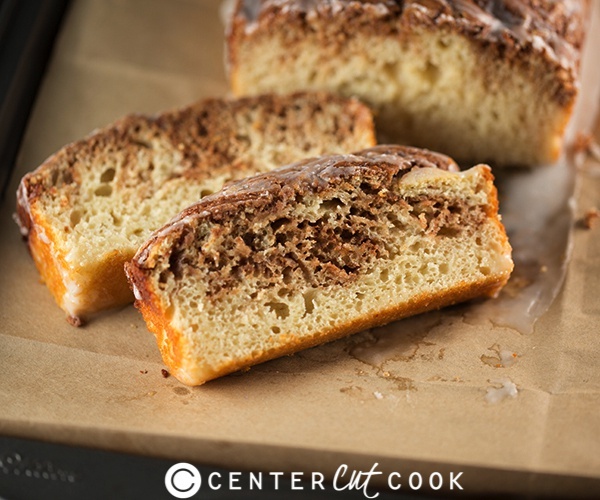 When I decided I wanted to make cinnamon roll bread, I knew I wanted another no yeast required recipe that was just as quick and easy. Yeast is fickle sometimes, ya know? Every single time I go to make bread that calls for yeast, I get nervous that I’m going to totally mess it up. 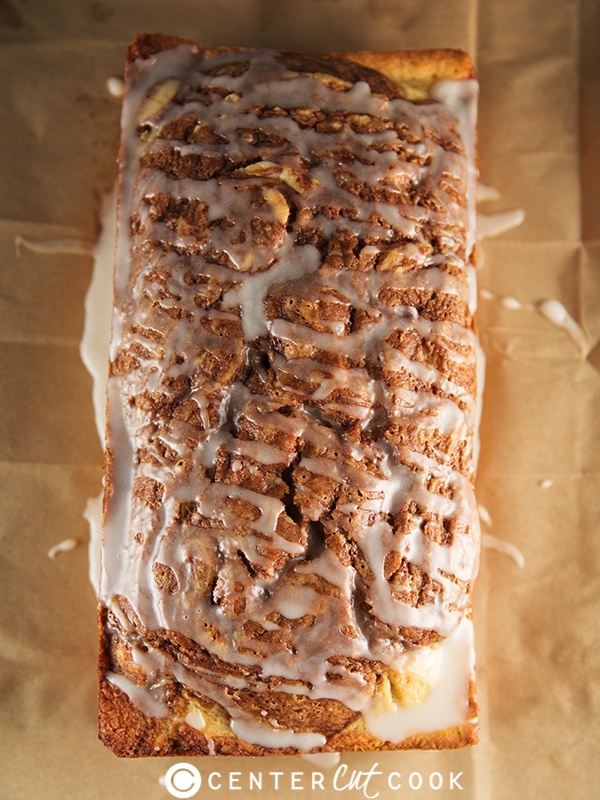 The good news about this quick and easy Cinnamon Roll Bread? It’s pretty much impossible to mess up. It’s fool-proof, and I love it. No bread machine or fancy bread maker is required. The dough can be mixed entirely with a spoon, and the result is so gosh darn delicious with a light icing/frosting that’ll make you swoon. My favorite part is the cinnamon streusel topping/filling that’s sort of like what you might expect on a coffee cake, or muffins. It’s crumbly, and cinnamon-y, and delicious. 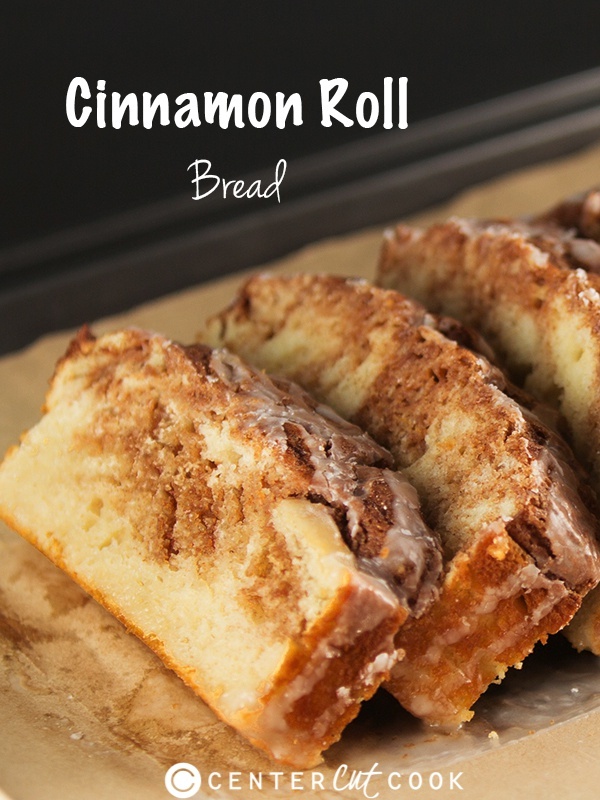 Now go grab a cup of tea or a big glass of milk, and enjoy this quick and easy Cinnamon Roll Bread fresh out of the oven! Pre-heat our oven to 350 degrees and prepare a bread pan (about 9×5 inches) by spraying it with non-stick cooking spray or lightly greasing it with butter. In a small bowl combine egg, milk, vanilla extract and yogurt or sour cream. Add the dry ingredients into the wet and stir to combine. You can use a large wooden spoon for this if you wish, no mixer is required. In a small bowl combine swirl ingredients together – 1/3 cup sugar, 2 teaspoons cinnamon and 2 tablespoons water. 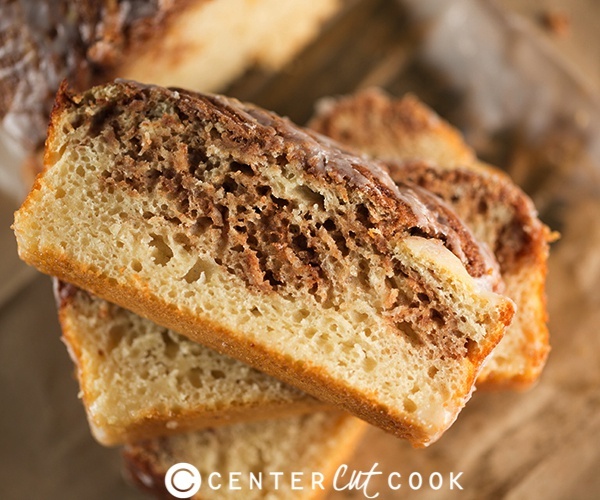 Use a tablespoon to drop spoonfuls of this mixture over the bread, then use a knife to make swirl designs to incorporate the cinnamon mixture into the bread. Meanwhile, make the glaze ingredients by combining 1/2 cup powdered sugar with 1 tablespoon milk. Remove the bread from the pan and allow it to continue cooling completely.